The purfling design on the back button according to one German shop is called 'Blume', meaning flower. I have seen about 4 different but similar designs on basses with Juzek labels. Some of them look exactly like Hofner's so I am confused there because I think if labeled, these could be put in by dealers and if not labeled, mis-attributed. Also, 100 years ago, both Hofner and Framus (then just Franz Wilfer) were violin shops in Schonbach. The second generation of these families I believe brought them into the Guitar business. Germans did however always make guitars as well but before the electric craze, these were just local brands. The Beatles made Hofner famous and at the same time, killed their name in as much as concerning the violin business internationally from what I see. So, a Hofner is as good as any other shop brand in my opinion. 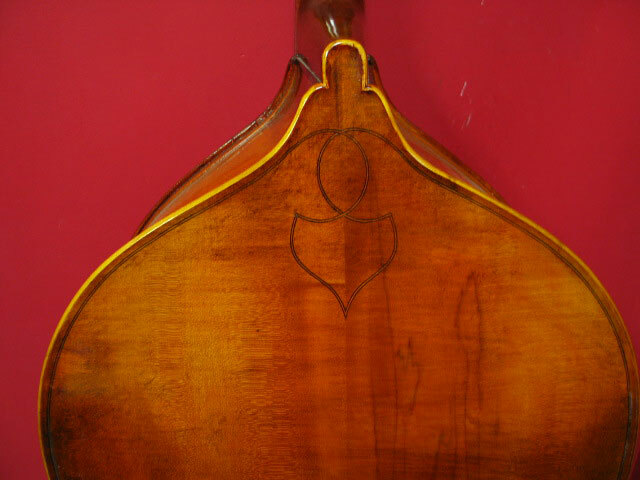 The next and most common design is the regular Juzek Flower seen since the earliest basses that look to me like Lang basses because I have seen them on Lang's as well. The other early design is more squashed in design and not as much upright. These might be Lang or even another shop. 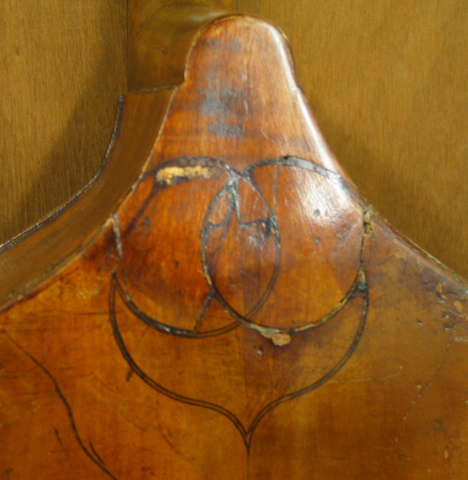 I have seen a similar design in a larger shape on some Bohemian basses of the period. So that one might be early Lang. The last of them is the fancier one we see today on the E. Wilfer basses but also on the Wenzel Wilfers and the earlier Anton Wilfers. These are all the same. So, that design whether Gamba or Violin shape in plain, medium or high flame are the Wilfer family made Juzeks or just, Wilfers. Ok, I have collected some pictures off the internet, 2 of them were mine so I borrow equally. Here are 5 designs, 2 of them are not Juzeks, Wilfers or Langs in my opinion. 1, this is a Czech flatback I had. I have seen many basses from Bohemia with similar but not exact designs. 2, this is a Hofner and I have seen people calling these Juzek's but in error. If they had a Juzek label in them, then they were probably put in there by someone other than Juzek in NY. I have no knowledge of Hofner selling to Juzek and I even once asked Hofner and they said 'no'. Not a single Juzek was ever made in Prague to my knowledge. Being born or having worked in Prague is one thing. Importing high volume of instruments has to be from an area that makes them and Prague is not that area. If it were made in Prague, the label would be in Czech and say just Praha, and not "made in". These were made in many models and sizes before and after the 2nd war. Values today do not reflect the price list from Met. Music/Juzek. They sell for what someone can get for them. Often over and under priced because there is no regulation, period. You can by an Amplifier or Watch or Computer and know the average price and get a good or at least a fair deal. When buying a bass that is famous for being sold to High Schools, you get a factory/shop made bass that was produced for export for a low price regardless of how well the have aged and/or survived. Things that hurt the value are poor condition, bad repairs, long string length, low neck overstand and poor quality sound. The mystique about the Juzek Master Art model makes me laugh and cringe as well, sometimes at the same time. I see dealers and players selling basses claiming to be a M.A. model. A Master Art model has Violin Corners, the Highest figure Flame maple, un-shaded golden or golden-brown varnish and, individual German made, french style tuning gears in Chrome. I have owned two of them, one by Anton Wilfer 1936 and one by Wenzel B' Wilfer that I knew in the shop from 1966 and bought it in 1971/72. Neither of these had Juzek labels because they were too nice to cover up. It would be like bronzing a Gold medal. The rear emblem on a M.A. model is #4 above. If you see or have a bass that you think is or is labeled as a M.A. model and does not have all of what I just described, it is NOT. I have seen many basses with that label that were put in by someone that just do not match the bass, sorry.